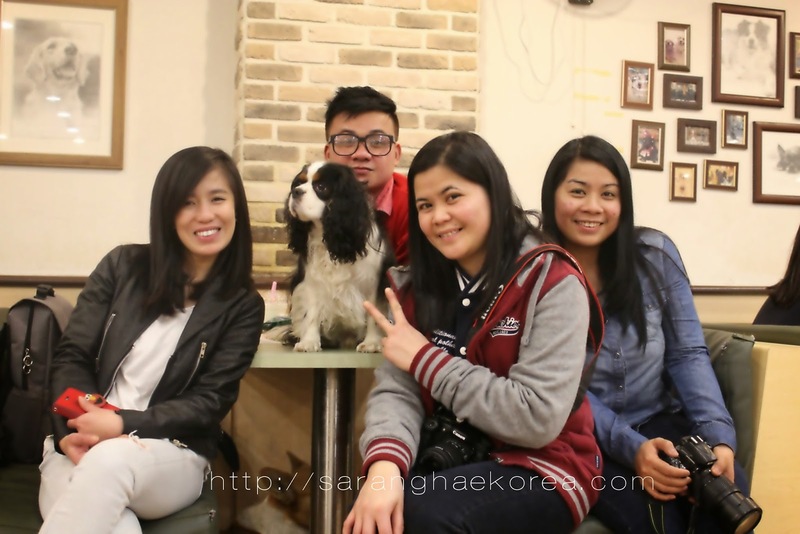 It was Sunday afternoon when me and my friends decided to pay a visit to the infamous dog café located in Hongdae Street in Korea. I have close to zero idea what’s the real deal inside a dog café. 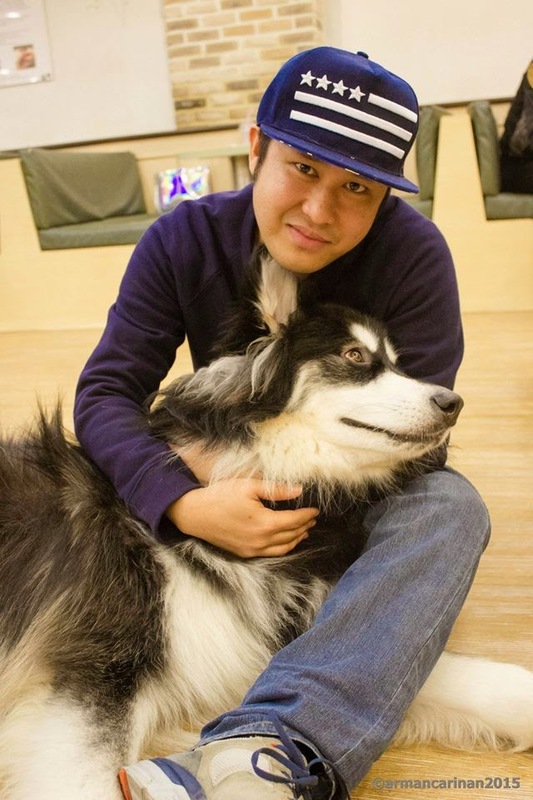 I know and I have been to a lot of cafes, it’s the first place to come in mind when you set up a meeting or quality time to talk with somebody, but a dog café? I am a dog lover but not really as in “lover-lover” because I get annoyed when they start to pee, and worse poop…. Haha… But I certainly love dogs, they’re man’s best friend after all. So we went to Bau House Dog Café and we were so early at 11:00 am, we found out that during weekends and holidays, they opened at 12:30. We patiently waited for the café to open. 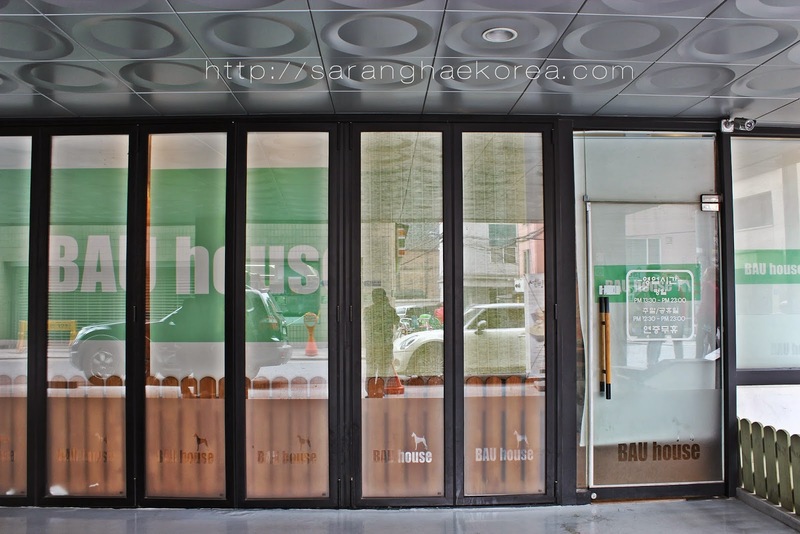 Bau House is located near Exit Number 3 of Hapjeong Station, I think it’s less than 100 meters away from the exit. When you exit at the station, just look for some signs of dogs and whatnot and you will definitely find it. This is how it looks like outside the café. When they opened the café, we were the first customers to get in, hurray!!! We were immediately attacked, I mean met by the armies of different types of dogs in the café. There are small and cute ones who barked like they’re giants, and there are big ones that could attack you like lion anytime… haha.. at least that’s how I felt. I was pretty intimidated by the dogs, but after 10 minutes, when I got used with the frequent barks and them following and running over you to beg some foods, I found myself enjoying the company of these friendly creatures. There is no entrance fee at Bau House Café, that means you can just go inside and play with the dogs, but you must order a beverage. We ordered some fruit smoothies which cost 8,000 won ($8.00) per cup. Dog foods are also available for sale. 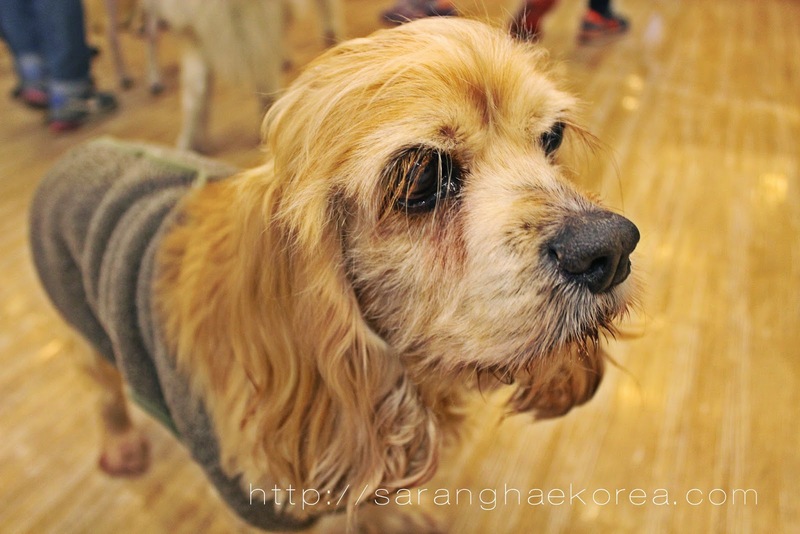 It costs 3,000 won ($3.00) to 3,500 won ($3.5), you can then feed this to the dogs so they will befriend you. However, you must feed them carefully and properly. Yes, there’s a proper way of feeding them, if you don’t want your fingers to be their meal of the day… haha… I have hard time at first but I commend the people at Bau House Café for ensuring the safety of their customers by teaching them the proper way to feed the dog. But favoritism is inevitable, I found a bestfriend and his name is “June”. He is one of the big dogs in the café, but he was so behaved and willing to be cuddled even without food. Unlike other dogs, you don't need to feed June to make friends with him. I spent most of my time with him. One of the things I commend about Bau House is that it definitely doesn’t smell like a dog. I really appreciate how they clean up the mess of the dogs immediately. There are people assigned to stand by to do the cleaning if a dog peed just to keep the cleanliness. If you are stressed and you want to unwind, I guess this is a perfect place to visit. Dogs can really entertain you in their own innocent and natural way. Dog lovers will definitely love this place. What a cute place to take your dogs to play with other dogs. Before Prince passed away, we used to take him to PetsSmart but that's the only place around here that allows pets to visit. That looks like so much fun! I wish we had dog friendly restaurants like this in the states. Thanks! Some doggie daycares have shops set up like this. I would love a dog cafe here! My baby would love to hang around there! That is so cute, a dog friendly restaurant would be so cool! Oh my gosh I wish there could be something like this near me. I have three little ones that need some new playmates and I just love the cafe environment so much, it would be the perfect combination. This one's an interesting concept for a cafe and if brought here in PH, I think it will be a huge hit. It would be perfect for dog-lovers. Are they ok with letting patrons stay long hours? Coz I'm thinking Bau House is dog-lover haven so it's natural that dog-lovers would want to stay there longer. I wish we had something like this near me! What a great idea! Wow! Now this is wonderful! I wish I could take my dogs somewhere like this! They'd be in heaven to go out more with me to places! Wow!What fun! That video just made me smile and all those little furry pups with each of you is adorable - everyone is 'de-stressing' for sure - Great story! Aw what a great environment for the dogs. I like that they area ll getting along so well too. I would love to do this. I would take my two dogs a few times a week. They would love the social interaction. Awww that is so nice that the dog has this kind of event, so cute. My JRT would freak out on this though. I imagine for dog owners, a place like this is so nice to have around. It looks like a lot of fun and definitely makes me want another puppy! Oh my gosh ... what a great idea! My husband and I love dogs. They are what we miss most when we are traveling. We would both really enjoy this place. Ahhhhh – what a cool place to visit, I would love to go to a place like that. I LOVE dogs. I also think it's cool to interact with different breeds. It's like a 'dog zoo' almost. That sounds cool. All those dogs in one place. Great looking photos also. Thanks for sharing. What a cool concept for all the pooches! It looks like a relaxed atmosphere and the dogs seem to be enjoying themselves. I love anything where I can bring my dogs! This looks a fun area. I am glad to hear they clean up after the dogs and that it doesn't smell! Wow! That is something unique. That place would surely be packed with dog lovers. I've been seeing a trend of cafes opening or starting to allow pets to come in. That is pretty cool of an idea. What a fun place!! I wish I could take my dog out to eat with me!! This is so crazy! I know dogs are great therapy for some so it may be a really nice place to go for those that need it, although it wouldn't be my cup of tea. I can't stand dog hair in my own home, let alone a cafe :/ Blech. I've heard of dog parks before, but never a place like this. Sounds like a great place for you and your dog. OFW Ka Sa Korea Kung…..